Let the sun shine in—this is Brilliance of the Seas®, a beautiful Radiance-class ship that combines sleek swiftness, panoramic vistas, and wide-open spaces. With acres of glass enclosing the nine-story central atrium, elevators facing the sea, and floor-to-ceiling windows throughout, you'll never be at a loss for an incredible view. Bask at the tranquil Solarium pool, recharge at VitalitySM Spa, or reach new heights on our signature rock-climbing wall. When the sun goes down, the night heats up with Broadway-style shows, Casino Royale®, plus 16 bars and lounges that never feature a cover. It's the amazing vacation you've been searching for. Spend the day exploring the world, then come back to your room and don't miss a thing. 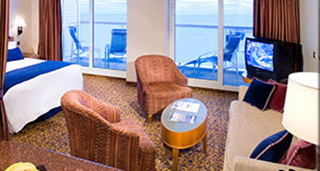 Take in the spectacular sights and enjoy the beautiful ocean view from the window in your stateroom Note that this is a guaranteed category and no particular stateroom number will be assigned until passengers are on board. 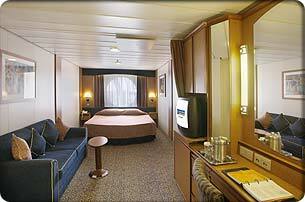 Balcony Staterooms offer a spectacular view, small sitting area. Note that this is a guaranteed category and no particular stateroom number will be assigned until passengers are on board. There is a possibility that the cabin may have a restricted view. Queen-size bed, private balcony, private bathroom with whirlpool tub, double sinks, separate shower and bidet, separate living area with queen-size sofa bed, and concierge service. 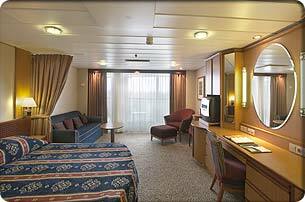 Two twin beds (can convert into queen-size), private balcony, sitting area (some with sofa bed), and concierge service. 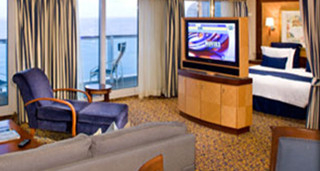 Also referred to as Grand Ocean View Suite.